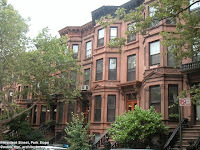 Kensington, Brooklyn: Bigger and better! So we've finally managed to score that sweet brownstone on 3rd street. We're really happy about our new place and think we should adjust our blog here too... hopefully you'll come with us. Well, everyone but Chris. The folks at our new food co-op already told us he's not welcome. Maybe you can all come visit our new home. It's even got a ramp to accommodate strollers and organic grocery carts. We're psyched.